The purpose of the site ist o call attention to the oldest hotel in Montenegro. This Hotel was built ower 100 years ago during the time that Adriatic coast belonged tho the Austian-Hungarian monarchy. In order of funtion as a hotel again, considerable investment is necessary. The young state Montenegro – came into being in 2006 after the collapse of Jugoslavia. The economic system fundamentaly depends on tourism. Travel possibilites are either to one oft he three airports wich are faily dose to each oter, by car through Croatia and Italy (by ferry) or by train: Prague-Vienna-Budapest-Belgrade-Podgorica. The Boka Bay – countryside is unique with a fjord-like similarity, which has been declared as the natural heritage of mankind. The cultural tradition eaches back tot he early ages and ist he home oft he most prominent monuments of Montenegro. The Community of Herceg Novi – grounded in the later part oft he middle ages, then turkish piracy and venetian fortess. Today one oft the most important tourist centres of Montenegro, dose to the Croatian border and a neighbour of Dubrovnik. The administrative centre commands the Boka Bay region together with the high montanious area inland. Zelenika – the village is just a short walk from Herceg Novi. It ist the joungst village in the Bay, grounded ca. 100 years ago through the most southern raiwaystation oft he Danube-Monarchy togheter with the harbour. Although the railway has now laid still Zelenika is today a alive commercially area. was grounded and built in 1902 by Dr. Antal Magyar from Budapest wo was Husar captain in the Kaiser and Kings army (not in office). This is the first touristicaly relevant hotel on the present day Montenegro, just a few years after tourism in Dubrovnik. The hotel was an inmediate success, thanks to the new railway connection to Budapest and Vienna and particulary due to the unusual position with private beach, park and surrounding forest. The hotel stayed in the possession of the Magyar family until the compulsory takeover by the state in 1948, and from 1960 was used as a childern’s convalescent home until the Jugoslavien civil war after which it became the residence of the Admirality of the residual Jugoslavian navy. Since the Year 2005 the house has been empty and neglected. At the present moment lawful proceedings fort he property tot he joint heirs are underway. 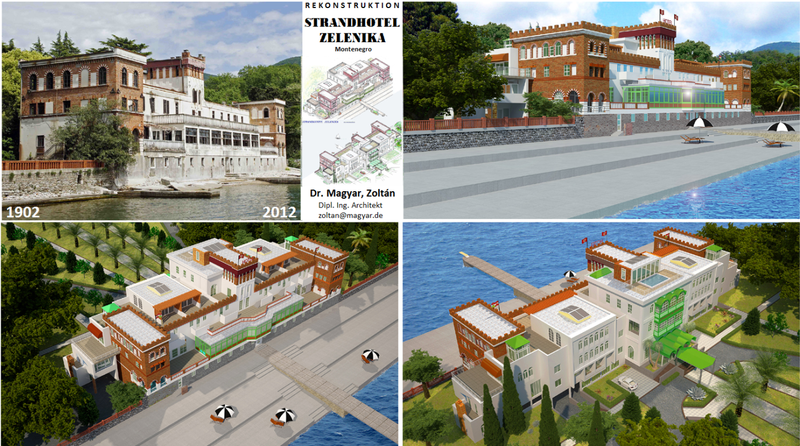 The urbanistic investigation for the solution of the coastal strip from the hotel to the harbour or respectively to the centre of Zelenika. Presently this is the area of the desertet railway station area apart from a frew residential houses. The investigation matches the plans enclosed herweith for the existing bulding, and a completely new complex of aparthotel which marina. Ground – the 100 year old park witch old trees and plants at the moment neglected and left to run wild. After the claring oft he wooded area it would only be necessary to plant small bushes and to build new paths. The beach needs to be newly styled, together with a strip wich belongs to the coastal road. New buildings – depending on the demands of the investors an extension to increase the amount of quest rooms and any other types of buildings required. Main building – could be reconstructed as a 4-5 star hotel whith 31 accomodation possibili-tes, with an extension in the direction of the park. The sea facade as a chararacteristic part of the Herceg Novis Riviera should be kept, and respectively reconstructed to its original condi-tion. Apart from the facility rooms and community rooms in the lower and ground floors, there are specifikations for living areas as suite with a swimming pool on the roof with a panorama view. The remaining 9 rooms are without a sea-view. The piece of land (park) totals ca. 8300 m². Together with the beach and the strip at the road – both owned by the state – the hotel grounds can be extended to rounghly 1 hectare. The reconstruction gross area totals ca. 2300 m² with 7000 m³ volume. The plantead extension gross area totals ca. 1200 m² with 3700 m³ volume. The judical estimate oft he total value in the state of 2012 is near EUR 6 million. As collateral to cover the entire cost of the reconstruction.